Unicook 15 Round Pizza Stone, Baking Stones for Grill and Oven, Heavy Duty Ceramic Pizza Grilling Pan, Thermal Shock Resistance, Perfect for Baking Crisp Crust Pizza, Bread, Cookies and More, 6.5LBS. Unicook pizza stones are made of all natural formulated cordierite, molding through 400 tons of pressure, heating over 2100F for hours. The strict production procedure ensures Unicook pizza stone with superior strength, durability, heat retention and excellent thermal shock resistance. 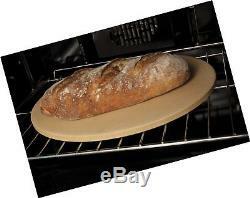 Made of FDA & LFGB approved Cordierite stone, no smell; Heat oven or grill safe up to 1,450F (787C). 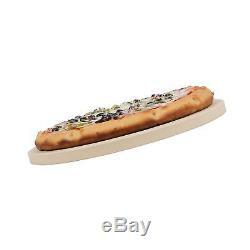 Ideal for cooking fresh or frozen pizzas on grill or in the oven, perfect for baking pizza, bread, cookies biscuits and more at home with family and friends. Measures 15 inch diameter, golden thickness 5/8(16mm), weigh up to 6.5lbs, distributes heat evenly for optimal cooking, much more efficiently than metal. Unicook pizza stone has invisible micro-pores which absorbs and eliminates excess moisture in the pizza dough to create a crisp crust for your pizza. Rinse to clean, and never use soap or detergent as it may be absorbed and affect the taste of foods. It is not dishwasher safe. Never season pizza stone with oil or grease. It will develop non-stick surface with regular use. Though pizza pan can appear in steel or other materials, only cordierite pizza stones work properly to cook a crisp and delicious pizza. Unicook cordierite pizza stone is built to outlast all others, absorbs and retains heat evenly and eliminates excess moisture in the pizza dough to create a superbly crisp crust. 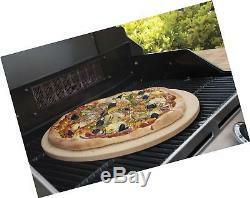 Unicook pizza stone can be used in outdoor grill and home oven. 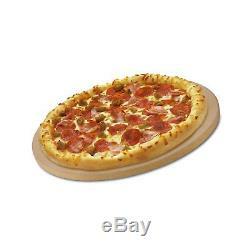 This stone is convenient for cooking homemade pizza and frozen pizza. In addition to pizza, the stone can be used to make breads, cookies, biscuits and more. 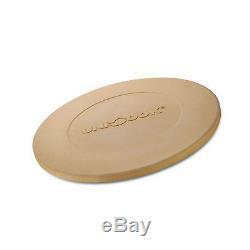 How to Use Unicook Pizza Stone It is important to know that pizza stone without preheating will not cook evenly. Please preheat the stone before placing food on it. 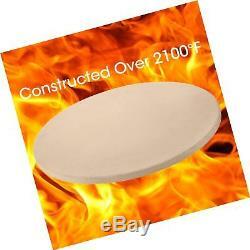 Place the pizza stone itself in middle of oven or grill and pre-heat it at 500° F (260° C) for about 30 minutes. Sprinkle flour or cornmeal on top of the stone to create a non-stick surface. Return both stone and pizza to the grill or oven, close the grill lid and cook the pizza for 10 to 12 minutes. Check in halfway to ensure the pizza is not overheated. Once the crust is brown, remove the pizza from stone. 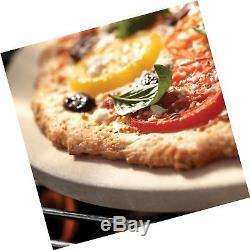 Read more How to Clean a Pizza Stone 1. Let the stone completely cool off before washing. Never use soap or detergent on a stone because the porous of the stone will absorb cleaning liquids and leave a soapy aftertaste. Hand wash with warm water. Use a brush or nylon pad to remove excess food. Air dry the stone completely after cleaning. Note: A well-used pizza stone typically has many dark, discolored areas, which is normal and no need to clean. It means your pizza stone become naturally seasoned and gets better to use. Read more Construction Unicook pizza stone is made of all natural formulated cordierite, molded under 400 Tons of pressure, super-heated to over 2100°F for several hours. The strict production procedure ensures Unicook pizza stone with superior strength, durability, heat retention and excellent thermal shock capabilities. Secreat of Crisp Crust Pizza Due to the special formul and production procedure, Unicook pizza stone has unique inner porous structure, full of invisible micro-pores. The porous of the stone absorbs and eliminates excess moisture in the pizza dough to create a crisp crust for your pizza. Warning Never season pizza stone with oil or grease. Never handle a hot pizza stone with your bare hands. Pizza stone can break if bumped or dropped. Do not cut pizza on a pizza stone. You may return items in its original condition within 30 days. The item "Unicook 15 Round Pizza Stone, Baking Stones for Grill and Oven, Heavy Duty Ce" is in sale since Monday, June 25, 2018. This item is in the category "Home & Garden\Kitchen, Dining & Bar\Bakeware".